This article is a short summary of Super Smash Bros. for Wii U.
Super Smash Bros. for Wii U is a Nintendo fighting game directed by Masahiro Sakurai for the Wii U. It is the fifth installment in the Super Smash Bros. series along with Super Smash Bros. for Nintendo 3DS. Super Smash Bros. for Wii U features the same playable characters as Super Smash Bros. for Nintendo 3DS, however, the selection of stages between the two are different, with more stages based on home console games than the Nintendo 3DS version. Face off against the biggest roster of Nintendo all-stars ever assembled! Send your rivals flying with powerful attacks to earn all-new customizations and equipment that trick out your fighter's moves and stats. Then power-up and train intelligent amiibo™ figures to take on your friends! The multiplayer showdown you known and love is now on the Wii U™ console! Take on all comers such as Mario™, Mega Man, Sonic, and more gaming greats. Or tap an amiibo to the Wii U GamePad controller to train it up by battling with or against it. You can even pit your amiibo against a friends' to see how your training methods stack up. Whether you're creating stages on the GamePad, competing in challenges crafted by Master Hand and Crazy Hand, or outwitting your opponents in a brand new board game mode, there's no doubt that the ultimate Smash Bros. game has arrived. 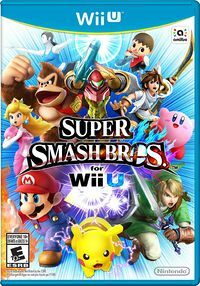 Like previous Super Smash Bros. titles, Super Smash Bros. for Wii U is a fighting game in which the main goal is for players to hit each other off the stage and KO them. Some mechanics from Super Smash Bros. Brawl, such as Final Smashes, return here, while others have been removed or refined. Both this and Super Smash Bros. for Nintendo 3DS feature the same set of playable characters, but different gameplay modes and stages. New modes in this game include 8-Player Smash, which allows for up to eight players to play simultaneously, and Smash Tour, a board game mode in which players move around a board collecting power-ups and fighters. Modes seen in previous games like Classic and All-Star also return but have been altered. Character customization has also been included in the form of Mii Fighters, equipment, and custom special moves. Players can also connect to the Nintendo 3DS version to transfer custom fighters to the console version and vice versa. Like Super Smash Bros. Brawl, this game features online connectivity. Players are able to play with friends or with anybody from around the world. In addition, this game uses a ranking system known as "Global Smash Power", in which players are given a score after clearing a mode to indicate how many players they did better than. Super Smash Bros. for Wii U is the first Nintendo game overall to be compatible with amiibo. When tapping an amiibo into the game, the character is inserted into the game as a "Figure Player" that can be trained and leveled up. 1.0.0 Default Version upon release in Japan and Europe. 1.0.1 November 21, 2014 Gameplay fixes; pre-installed with downloaded versions of the game. 1.0.2 January 29, 2015 Adds 15 stages to 8-Player Smash, gameplay adjustments. 1.0.6 April 15, 2015 DLC functionality added, Share mode added, 6 stages added to 8-Player Smash, gameplay adjustments. 1.0.7 April 23, 2015 Fixes glitch caused by the Mewtwo DLC that interprets Global Smash Power data as invalid. 1.0.8 June 14, 2015 Allows the game to receive the second wave of downloadable content, Miiverse stage added (adds "support" communities for every character), gameplay adjustments. 1.0.9 July 2, 2015 Gameplay adjustments. 1.1.0 July 30, 2015 Tournament mode added, adds the ability to upload saved replays to YouTube, allows the game to receive the third wave of downloadable content; gameplay adjustments. 1.1.2 October 8, 2015 Fixes a glitch that causes Diddy Kong to be unable to be grabbed when hit with an attack that hits multiple times while shielding. 1.1.3 December 15, 2015 Adds compatibility with the latest set of downloadable content, gameplay adjustments. 1.1.4 February 3, 2015 Adds compatibility with the latest set of downloadable content, gameplay adjustments. 1.1.5 March 15, 2016 Gameplay adjustments. 1.1.6 May 20, 2016 Gameplay adjustments. 1.1.7 July 18, 2017 Adds compatibility with the Cloud, Cloud (Player 2), Corrin, Corrin (Player 2), Bayonetta, and Bayonetta (Player 2) amiibo. Lucas, Roy, Ryu (June 14, 2015). Bundle #1: SSB T-shirt, Link Cap, Link Outfit, Majora's Mask, X's Helmet, X's Armor, Proto Man's Helmet, Proto Man's Armor, Dunban Wig, Dunban Outfit, Cat Hat, Cat Suit, Monkey Hat, Monkey Suit. Released April 15, 2015. Set #3: Hoodie, Chrom Outift, Chrom Wig, King K. Rool Outfit, King K. Rool Hat, Bear Suit, Bear Hat, Flying Man Suit, Flying Man Hat, Lloyd Outfit, Lloyd Wig, Black Knight's Armor, Black Knight Helm, Samus's Armor (+Samus's Helemt if not unlocked). Released July 30, 2015. K.K. Slider: K.K. Slider Hat, K.K. Slider Outfit; exclusively downloadable at 7-Elevens in Japan between June 19-July 11, 2015; later released for free with the 1.1.0 update. Bundles featuring sets of DLC are also available. ↑ Wii U & Nintendo 3DS Developer Direct - Super Smash Bros. for Nintendo 3DS and Wii U @E3 2013 - via Youtube. ↑ Sakurai's post. (June 5, 2015.) Miiverse. Retrieved June 9, 2015. This page was last edited on 28 October 2018, at 18:53.